The entire incident was caught on CCTV camera. Watch the video here. 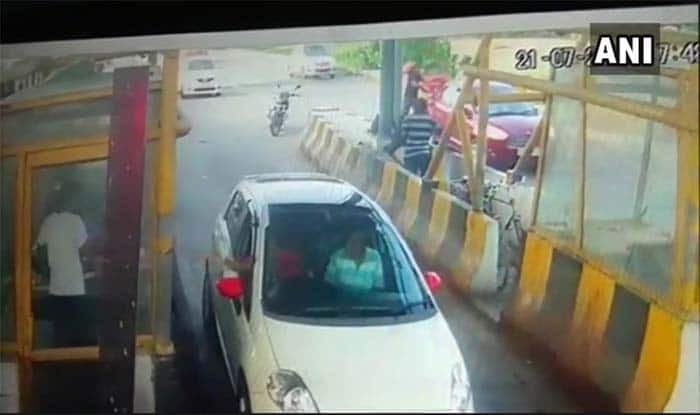 Gurugram: A toll plaza booth employee in Gurugram’s Kherki Daula was allegedly abducted and beaten up when he asked a car to stop and pay the toll tax at the booth. Following his (toll employee) intervention, four men sitting in a Toyota Innova tried to run over him. The man was put on the car’s bonnet and dragged for nearly 6 km by the four men. The entire incident was caught on CCTV camera. In the video, the employee was seen tapping the bonnet of the car, but this the car driver did not stop. “The car driver dragged me for 5-6 kilometres on his car’s bonnet on a speed of about 100 km/hr. He said,’You’ll stop my car? Even police doesn’t stop my car’,” news agency ANI quoted the victim as saying. Meanwhile, police have ordered an investigation into the matter. The Kherki Daula toll plaza has witnessed a number of incidents of violence and confrontations including one in January this year when police created chaos at the scene and tried to flee without paying the tax.